The Class B, often called a campervan, is the perfect answer if you're looking for both transportation and accommodation. Class B Campervans are a versatile and economical option for those who seek the traveling lifestyle and are willing to stay in a compact space. Class B features include a small kitchenette, a small all in one bathroom that gives you the option to shower while seated, captain chairs that swivel for multiple uses, and a couch that converts to a sleeping area. Campervans are fully contained with water tanks, toilets and electrical hookups. Class B's range in length from 20 to 29 feet and are between 6 foot 11 and a eight feet wide. Traditional Campervans also have a lifted roof that allows guests to stand fully while inside the living space. Floor plans vary and may include collapsible tables and hidden storage. 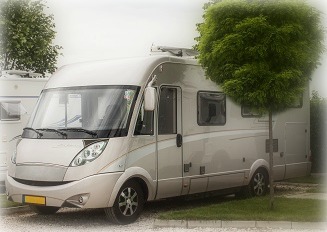 Self Contained- Traditional Class B motorhomes are fully self-contained. Campervans have a plumbing system with both gray and black tanks to hold waste water. Self-containment means you can camp just about anywhere without worry when nature calls. Easy to drive - If you can drive a van, you can drive a Class B. There are no license requirements and most everyone will feel comfortable driving it. Simple parking- Parking a Class B is like parking your car. Easy! Want to camp in the woods or stay overnight on the side of your best friends house? No problem! A Class B can go just about anywhere! Towing is no problem - Class B's are compact, but they pack plenty of engine power. If you want to pull a car, trailer, or jet ski, odds are, you can. Well equipped - New Class B's offer lots of luxury. They sport everything from air conditioning and Bose sound systems to skylights and nu wave stove tops. Year-round use - New Class B's can be used all year. With help from outstanding insulation and electric power, they stay cool in the summer and warm in the winter. Easy to Run Solar - New Class B's offer solar add-ons proven to even run air conditioning without turning on the motor. The secret is the space efficient Lithium batteries that harness the sun and hold the energy in tiny space. Good gas mileage- Class B's boast 20 miles per gallon or more! Exploring just became a whole lot cheaper!